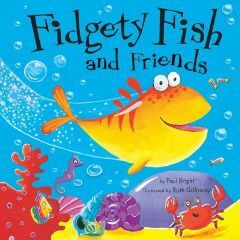 ‘Fidgety Fish‘ is a wonderfully colourful and vibrant picture story book written by Ruth Galloway for young children. Every page is filled with gorgeous pictures and beautiful language and in my opinion is a must in any small child’s book collection! Anyway Tiddler meets all sorts of wonderful sea creatures – limpets, jellyfish, starfish and many more – until he comes to what looks like a big dark cave which he thinks looks much more interesting than his cave. However, if you look carefully at the illustration the more observant will realise that it’s actually something much more sinister! Yes, Tiddler has inadvertently swum into the mouth of the Big Fish and it’s very dark in there! Luckily because he is very scared he quivers and shakes so much inside that he causes the Big Fish to let out an enormous BURP! (My daughters find this incredibly funny for some reason!) This allows Tiddler to escape and he manages to go straight back to his mum, where he is so tired after his adventure, that he falls asleep before he can tell her all about his big adventure! Job done – he is definitely fidgety no more! My daughters and I love this very simple but effective story but as I mentioned earlier there are two things which I really think make this book. Firstly are the wonderfully colourful and bright pictures. I think the beautifully bold yet simple drawings are really appealing to young children. The colours draw them in and there is just enough detail on each page to involve them without confusing them too much. Tiddler wears some brilliant expressions on his face – you can see one on the front cover of the book. There is one very clever picture in the middle of the book where the Big Fish is cleverly disguised as a cave. If you look very carefully, at the top of the cave you can just about make out a pair of eyes. If you read this with your little one it’s worth pausing on this page to see whether they spot it! The other thing I love about this book is the beautiful expressive language, particularly when Tiddler’s movements are being described. For example, when describing his fidgeting we are told that he ‘wriggled and squiggled, he darted and giggled…’ Later when he is inside the Big Fish we are told that ‘he trembled and shivered, and he shook and he quivered…’ These are lovely words for children to enjoy as well as starting to introduce them to the concept of rhyme. The font used in the book seems very child friendly. I’m not sure what it is but it looks almost like a young child’s handwriting. As well as this, sometimes when a lot of movement is being described the words dance all over the page as if to illustrate the wriggling and squiggling, etc! The version of the book we have is also accompanied with a CD. It has two tracks, one telling the story but with music and sound effects which is lovely. And then there is a second track which has the story but with pings to tell the child when to turn the pages so that they can start to join in. The narration is by Doon Mackichan and Jamie Theakston. Both of these are great extras but my daughters always preferred me reading to them! No Comments on "Fidgety Fish and Friends"